The mission of the International Community Council - Worldwide Intercultural Network (ICC-WIN) is to "Celebrate Cleveland’s multicultural communities through collaboration and cooperation on initiatives that promote the prosperity of the region and its diverse people". 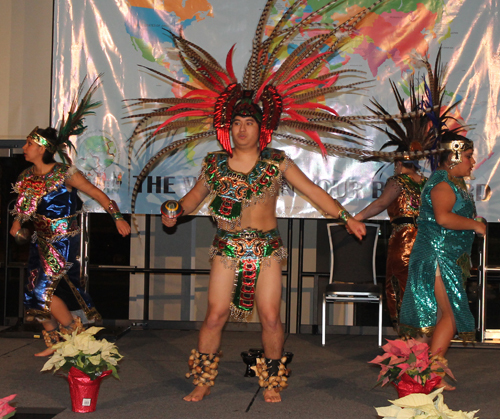 One of the most popular of ICC-WIN's activities is the annual Multicultural Holiday Party. The 2016 event, held at the Global Center for Health Innovation, was the 7th annual party. Hundreds of people from dozens of diverse backgrounds gathered to sample international foods, watch performances, view an international fashion show and meet and socialize with others. Here are some highlights. Be sure to click on the links to see all the photos and videos from the evening. ICC-WIN president Ken Kovach welcomed the crowd to the 7th annual Cleveland Multicultural Holiday Celebration put on by the International Community Council Worldwide Intercultural Network (ICC-WIN). He also introduced event Chairman Mehmet Gencer who thanked the committee members and then Nada Martinovic who chaired the performances. While attendees sampled foods from Cleveland Tiffin (Indian), Dragon Light (Vietnamese), Empress Taytu (Ethiopian), Gintaras (Lithuanian), Kan Zaman (Middle Eastern) and Li Wah (Chinese) a silent auction was held (Chaired by Mehmet Gencer) and performances (Chaired by Nada Martinovic) began. 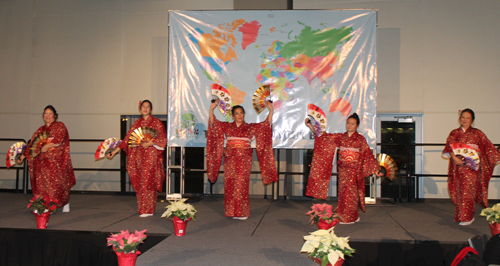 The entertainment began with a performance by the Sho-Jo-Ji Japanese Ensemble. Photos and videos from Sho-Jo-Ji's traditional performance. 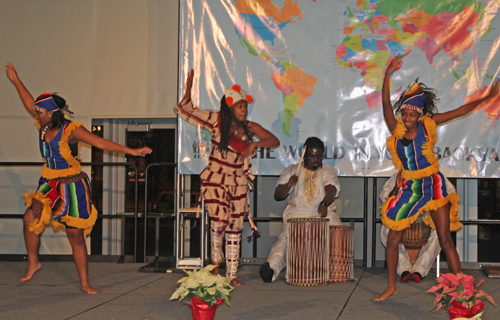 The second performance was by JAPO African Ensemble from Senegal. Photos and videos from JAPO's energetic performance. Photos and videos from Tepehuani Nelli's colorful performance. Next came the International Fashion Show featuring over 100 representatives from more than 20 countries. 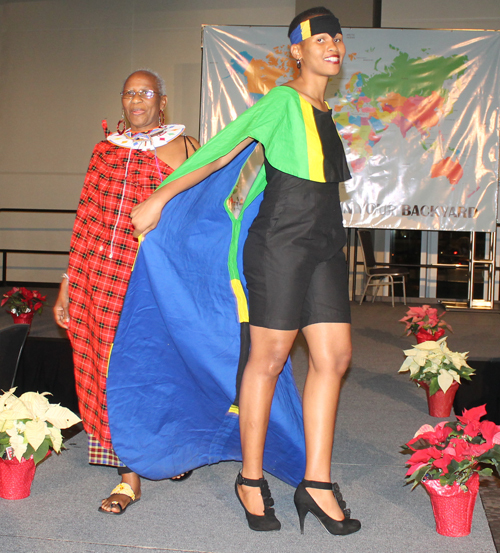 A new feature this year was that each group walked the runway to the sounds of music of their country or region. You can see photos and videos of the colorful traditional clothing worn by the models in the Fashion Show. The Fashion Show ended in a Grand Finale with all the participants gathering back on stage. The Hula Fusion Polynesian Ensemble was the final act of the evening. Photos and videos from Hula Fusion's colorful and rhythmic performance. After the performances, ICC-WIN president Ken Kovach thanked the crowd and gave best wishes on behalf of the board of ICC-WIN to all. But wait, there's more! When the 7th annual Cleveland Multicultural Holiday Celebration ended, many did not want to leave. So DJ Kris Koch kept playing international music and an impromptu dance jam took place on the stage. Congratulations to Event Chair Mehmet Gencer and his committee of David Delgado, Tuba Gokoglu, Murat Gurer, Gia Hoa Ryan, Nada Martinovic, Radhika Reddy, Dan Hanson, Lisa Wong, Ken Kovach and Pierre Bejjani for a wonderful evening showcasing the diversity of Cleveland. People Page - Who do you recognize? Stay informed about the local ethnic and international community by signing up for the free eNews mailings for any group or groups (or all) that you choose. It's easy and free. Fill out the form for the free ethnic eNews.